A photo pass on my Facebook wall today with this words on it: "The tongue has no bones, but it is strong enough to break a heart. 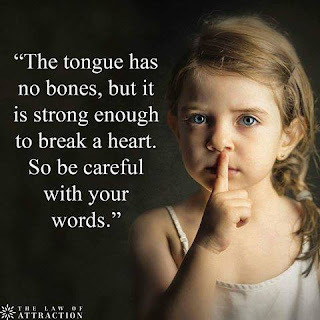 So be careful with your words." This is so true. How may hearts have been broken because of careless hearts. Words are powerful. The words we tell children remains a lifetime. Words can break or build the life of someone. But, not only the tongue is strong to break hearts but the tongue is also powerful to destroy relationships. Let us not only let us be careful with our words as to not break others, but let us also weigh in words we hear from others. Once we believe a gossip, it can damage and destroy relationships.